Jonny formally joined GMT in August 2013, having advised GMT since mid-2012. He brings a wealth of General and Limited Partners' perspective spanning almost 30 years, having managed and raised many successful funds during that time, focusing on both fund and direct investment transactions. Formerly Global Head of Private Equity Fund of Funds at Allianz Private Equity Partners, Jonny had overall responsibility for indirect private equity activities. 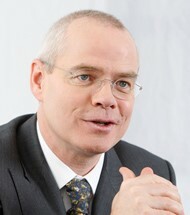 Prior to Allianz, he was Founder and Chief Executive at Standard Life Investments (Private Equity), now known as SL Capital Partners. During his 17 years at Standard Life he built the private equity business and assets from a small single client operation into an international multi-client manager with private equity assets over Euro 5.5 billion. Jonny holds a Bachelor of Law degree from the University of Strathclyde, an MBA from the University of Edinburgh and is Fellow of the Chartered Institute for Securities and Investment. He is Chairman of the Muir Maxwell Trust which he founded in 2003, he also sits on the Advisory Board of Argentex and on the Board of SWR Waste Management.